Set boundaries and be honest about what you want: You’re going to be sharing a room with this person for the next 9 months; this just means that you need to set some boundaries. This includes things such as food, clothes, space and time. Will you share food? Clothes? Can they go into your stuff if they need to borrow something while you’re gone? Are there specific time you can and can’t use the TV? Do you plan to study in your room or at the library? You don’t need to have 100% of this figured out, it will come with time, but you do need to consider where you stand and what you want. However, you do need to consider the important things immediately because you’ll fall into a routine and you need to respect that it is as much their room as it is yours. Food can be shared, but be respectful. If it’s their favorite food ever ever ever, proceed with caution (like if you eat my roommate’s red sour patch kids….you may want to sleep with one eye open). Also, don’t finish their food. That’s just cruel. Share clothes, but ask first. More than likely you’re going to need/want to borrow a shirt or dress or something of your roommates, just establish rules about what and when they can take and if they always need to ask. There are plenty of other things you could need to share (DVDs, chargers etc), just be sure to discuss the rules as they come up. Have communication skills: FOR THE LOVE OF ALL THAT IS GOOD IN THIS WORLD, COMMUNICATE. Passive-aggressivity is not the way to go in a roommate situation. If there is something they repeatedly do that is bothering you, nicely bring it up. If you need to address something that isn’t working or a rule that needs to change, do it. Don’t sulk around getting all pent-up with anger because you’re too petty to bring it up. Just do it. You’ll thank yourself later. Set some ground rules: more rules, yay! Here I’m talking more about rules for having people over and doing work and watching TV and all of that jazz. You’re inevitably going to have a time when you have people come to stay for a night or weekend. Your roommate deserves advance notice in this situation. They don’t necessarily have to make other plans to be gone (you are in no way entitled to kick your roommate out of the room for an extended amount of time, it is as much their room as yours), but they deserve time to make any plans they need or want and prepare. It’s also important to establish rules about the use of TV and music in the room. I personally do most of my studying and homework in my room, as does my roommate. Therefore, we don’t really want the TV on in the middle of the afternoon. Some people prefer to work outside of their room so they may not care if their roommate watches Ellen everyday at 4pm. It all depends on personal preference, just be sure to talk it out. R-E-S-P-E-C-T: Have respect for the person who shares the same room with you. It’s just basic courtesy. Do your part: You will have to clean and do chores. Share the burden. Freshman year we made a chore chart for our room, we rotated taking the trash out and washing the dishes and then jointly cleaned the room/bathroom about once a month. DO NOT put all of those duties on your roommate (they will hate you). DO NOT not do chores (it’s gross and smells and it’s just not a good idea). If you’re having problems with getting your roommate to do equal work, talk about it (or make a chore chart and nicely force it upon them!). Find something to bond over: living with a roommate can be awkward and weird at first. Find something you have in common and bond over it. My roommate and I bonded over a mutual love of Taylor Swift and then continued to bond over TV shows and musicians and other things. Try to find something you have in common and cultivate a relationship with that in mind. 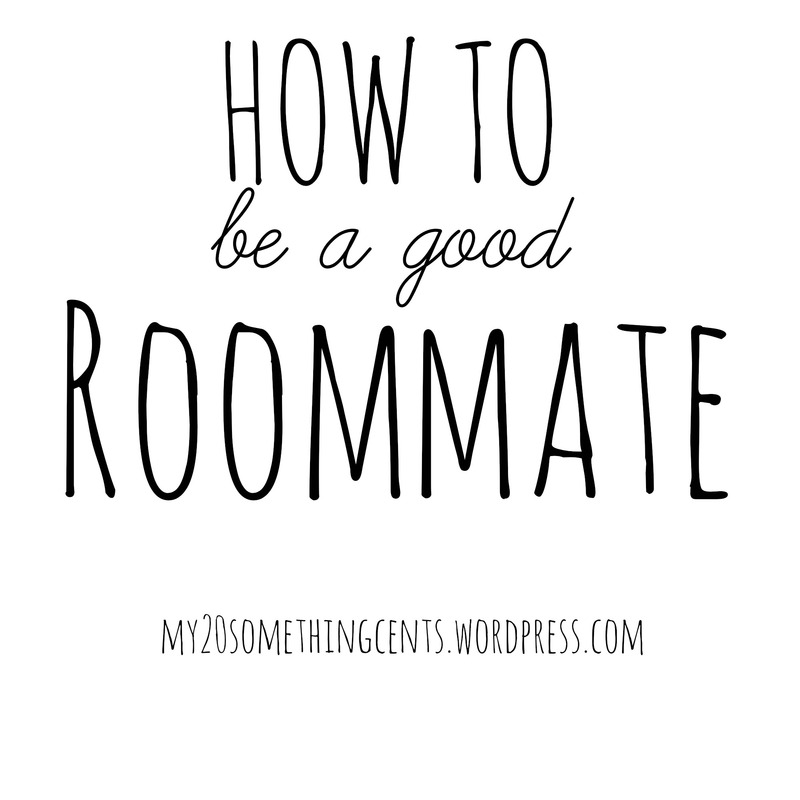 Your roommate can be an amazing rock and confidant in your life. Try new things together. Try something they like. Keep an open relationship because it will benefit you in the future. Help them out: if your roommate is struggling with something, whether it is time-management or course load or being homesick: help them out. Let them know you are there and help in any way you can. Moving away from home is not easy and everyone struggles in his or her own way. Be there for them, roommates stick together. All this being said, I have the best roommate in the world. We met on a roommate matching website through our university and clicked instantly and we have been insanely lucky to have bonded and connected in the way we did and maintain such a strong relationship (she’s the Cristina to my Meredith and I had to write that in here because she said she would kill me if I didn’t include a Grey’s reference). Also, sorry not sorry here is a nice montage of our faces. However, I do realize that this is not the case for all people. In the event that you end up with a not-so-great roommate these rules still apply. You obviously don’t need to spend extra time with them, but you still need to set boundaries and establish rules and communicate your needs. Mutual respect is rule numero uno for roommate situations and if you can make that a rule of thumb in your dorm, your roommate may not turn out to be so bad! Always remember: it is as much their space as it is yours.